Lesson Learned. For The 9,423rd Time. Today I went to an emotionally uncomfortable brunch. I won't go into why it was uncomfortable. Suffice it to say that I was worried about miscommunication and hurt feelings. 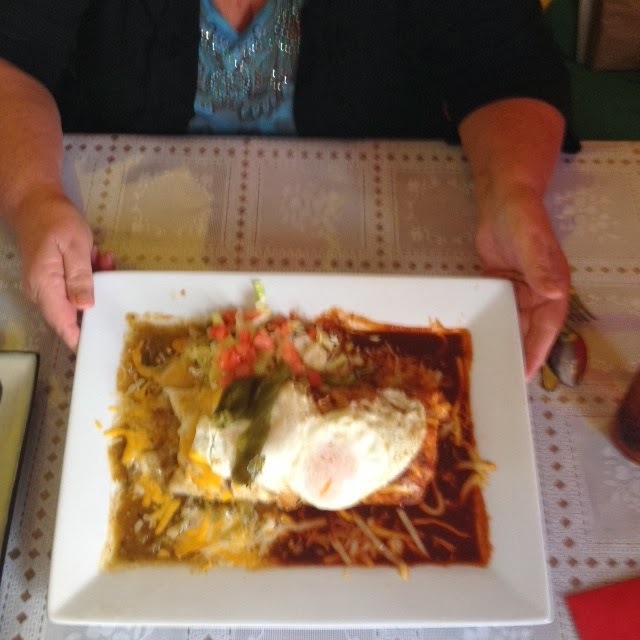 We went to a restaurant that we had never been to before - close to downtown Santa Fe on Old Santa Fe Trail. I'm wanting to try some new restaurants. I'm now in my 30th year of living close to Santa Fe, a city of many, many great restaurants. I have my old faithfuls, and I want to spend this year broadening my restaurant horizon. That may not be a good plan for a time that I'm trying to learn to eat differently. I did some things ........ well, one thing .......... right. Last night, I looked online at the menu and decided what I wanted to order. I was going to order a Baja Shrimp Salad with shrimp, fresh fruit, avocado, jicama, and field greens. And I did some things wrong. Donna and I got to the restaurant about 20 minutes before Nina and Elisa. So... we ordered chips and salsa and guacamole. First mistake. Donna is sick and was trying to stick to bland foods so I ate most of the chips and salsa and guacamole. Second mistake. 20 minutes is a LONG time so, by the time Nina and Elisa had arrived, I had eaten all of the chips and salsa and guacamole. Third mistake. In that 20 minutes, Donna and I also read and discussed nearly every word on the two-page menu. So, when the waitress came, I ordered a thing called an Illegal Burrito. It was filled with potatoes, carnitas, cheese, and red 'n green and had two over-easy eggs on top. In an attempt to "grab a life jacket" and not drown in overeating, I asked for a to-go box before I started. The words "emotionally uncomfortable" and "meal" should never be used together. If I am emotionally uncomfortable, you can bet your bottom dollar that I'm not going to be vigilant or very conscious about what goes in my mouth. And the really horrible thing is that before we had even walked back to the parking lot, I had the awareness that I had spent a lot of calories AND a lot of money - for something I didn't really enjoy. It wasn't even that good. It's not going to be the last time that I have an emotionally uncomfortable meal. But the lesson is, when I know that I'm uncomfortable, I need to PLAN to not be as conscious or vigilant while eating. It's like planning to complete a job in the dark. Before hand, you make sure you know where you need to go, what you need to take, exactly what you need to do - because you know that you won't have light to make your job easier. For me, eating - when my mind is preoccupied with something else - is eating in the dark. I have little awareness or knowledge of what I'm doing. I wonder how many times I'm going to have to learn that lesson. And what about the lesson IF SOMETHING ISN'T THAT GOOD, DON'T EAT IT! That's what skinny people do. I need a LOT of work on that one. I've done good today except for my recent nemesis, COFFEE CREAMER. 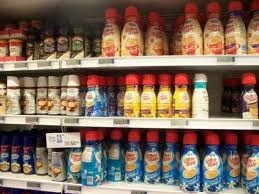 Have you looked in the refrigerated coffee creamer section of your grocery store?? There are all sorts of wonderful flavors - sweet Italian cream, chocolate, peppermint mocha, Girl Scout Thin Mint cookies, salted caramel............ Yummmmmmm. Just the names add inches to my belly. At this morning's breakfast party, I had two scrambled eggs and a piece of toast AND about three cups of coffee with Peppermint Mocha creamer - that I carried to the restaurant myself. Tonight, I had green chili turkey stew, two pieces of chipotle cheddar cheese, and a cup of coffee with Girl Scout Thin Mint creamer. That's probably like eating half a package of Thin Mint cookies. But I still feel like I've had a successful day. And I thank God for it, because it's Saturday and I've had to be in control of myself. I'm not going to give up on coffee creamer yet. It took me 57 years to start drinking coffee! I'm not quitting now! I think one of the most important times for me to blog may be when I don't really want to. Because I think that's maybe the beginning step of me 'closing my eyes' and not being conscious of where I'm going and how I want to live my life. Tonight, I don't really want to blog. I don't really have anything to say. If I had a 5 point scale of successful eating, today would be a 3. Not real bad, not real good. But maybe that 3 is a dangerous place. Maybe 3 is complacency. I ate more than I wanted to today but did OK for going out to eat twice and once for happy hour. Lunch at Morning Glory was a cup of green chili soup and a grilled chicken salad. Happy Hour at Dixie Girl was two virgin Bloody Marys and a dry salad with salsa. Dinner at Rigerberto's was machachas, beans, and half a tortilla. See? I told you going out to eat is my primary social activity!! Good choices, but too much. I could have probably stopped after Happy Hour. But....... I didn't. I don't like to blog when I don't have anything clever silly to say. I want my blog to be entertaining. I don't want to list what I ate. That is b.o.r.i.n.g. But, I need to be blogging for me, not you. That means when I'm not clever and entertaining, I'm not clever and entertaining. But I still need to blog. That's a tool that I have to SEE myself. And if I can't see myself, there is no telling what I'm probably stuffing into my mouth. Today, I won the fight with food. But I wouldn't have without the help of friends, planning, and a tiny smiggen of my own will power. Marcie did fill my plate at the potluck. Luckily, I was busy with IEP's and the School Store and didn't even have a chance to walk into the teachers' lounge. Marcie left me a plate on my desk and it was the perfect plate of food for someone who is trying to eat healthy. She did a great job! But..... I was very aware that Marcie's plate for me was much different than if I had filled it myself. She gave me a dollop of hummus, some quinoa salad, fruit salad, a dollop of chicken salad, and some veggies. She also brought me a bowl of Rita's turkey/green chili/quinoa soup. 1. I don't think I do dollops. And you know what? When you have a bunch of different things on your plate, a dollop of each thing is enough! I think, even at a potluck with many different things on my plate, I do servings. And to me, a serving is like a cup or more. Marcie's plate was beautiful. I wish I had taken a picture. This is the first time that I have had potluck without piling food on top of food. Does anyone else to that? When I eat at a potluck, not only do I have to work my way eating around the plate, I have to work through the different layers. Architecturally (as though I know squat about that), my plate filled by Marcia was a one-story house. When I fill my plate at a potluck, it is an five-story office building. 2. Eating the bowl of soup that Marcie brought me, I was aware that when I put soup in a bowl (or cereal or ice cream or anything else one uses a bowl for), I have to walk very carefully in order not to spill. I fill to the rim. Luckily, I have all those years under my belt where my mother made me walk around with a book on top of my head to learn to walk smoothly. Otherwise, I wouldn't be so good at pigging out on foods inside of bowls! I was aware that I fill bowls like I used to fill red wine glasses. It was late in my drinking career that someone told me that they were only supposed to be filled to a third full. I still don't understand that. Why? Why? Why????? Lunch was a great success. But I still had Bunco ........ otherwise known as spend-two-and-a-half-hours-with-your-hand-in-constant-motion-between-your-mouth-and-a-food-source. Luckily, I went to Tara's for dinner first. She made an amazing stir fry chicken recipe and homemade cinnamon raisin bread (only one piece, I promise). So I was able to spend the evening playing Bunco and I only ate grape tomatoes and a Diet Coke! And the best part........ I WON the most Buncos and the prize is a body wrap! 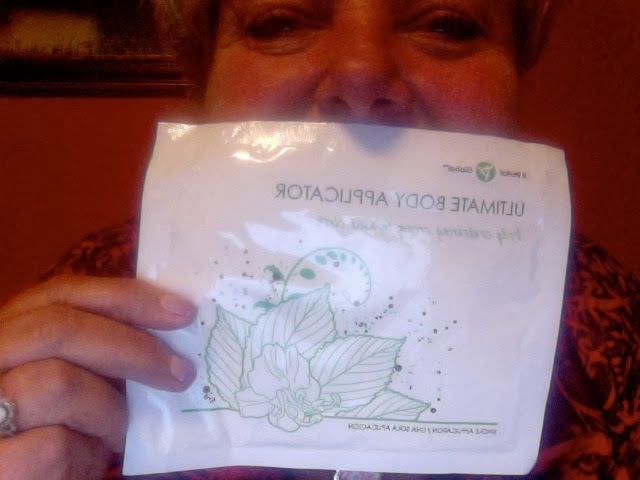 I've heard about these body wraps but haven't ever tried one. I'm excited! Uhh, can you read that backwards? I'm going to bed feeling like I've had a successful day................ with a little a lot of help from my friends. Uh-Oh. It's A Morning Blog About WILL POWER! There's just a potential portion problem here. Big time. We have like 75 staff members. That's a lot of stuff. I just figured out how I'm going to handle this. I'm going to have Marcie make me a plate. Marcie is very health-conscious and slender. Plus, I've already given Marcie permission to yell at me tonight if I try to eat when we have BUNCO AT HER HOUSE!!!!!!! That's right. A potluck on Bunco day. A double whammy. So, today........ I'm going to use Marcie's will power instead of my own. You think that's kosher? Today has been truly a HUMP day. That kind of day. It's been like emotionally climbing a hill and being out of breath and just wanting to sit down and have someone come pick you up in a car. It started in a silly, this-only-happens-in-my-life sort of way. I woke up at 2:00 this morning to the smell of poop. (Not my own.) Three dogs, a cat, and me were all locked up in my bedroom. I went to my adjoining bathroom and sure 'nuf, there was cat poop in the shower. Well, if you know me on Facebook, you know how I feel about cat poop. I decided to go back to bed, let it dry and pick it up in the morning. At 3:00 this morning, I woke up because Nurdy and Kylie (Barb's dog that I was dog-sitting) were jumping back on my bed. Nurdy gave me his usual dog kisses and Kylie curled up under the cover behind my knees. I got up to use the bathroom and, lo and behold, the cat poop was GONE! Like magic! Right into Nurdy and Kylie's mouths right before I got the facial kisses and the friendly licks to the back of my knees. 1. I had lost another pound this morning when I weighed in. 2. Even though it has been a frustrating day, I have not drowned my emotions in food. 3. I still have one meal to go but I think blogging now will keep me conscious and emotionally "awake" at dinner time. I will continue to add to today's gratitude list. As long as I focus on that, I'll be OK.
Take a deep breath. It's just a bad day, not a bad life. Right now, I feel proud of myself. I (the big I) have been in control of eating today. Eating has not been in control of I. OK, me. This morning, Barb and I had to go to McDonald's to get a breakfast meal for a student that I am rewarding for coming to school. Usually, if we go to McDonald's, I get a breakfast sandwich. Today, I was able to do something different. I got a 'big breakfast' of scrambled eggs, bacon, hash brown, and biscuit. I ate the eggs and bacon and saved my hash brown and biscuit for a student that I know that never has breakfast and is always hungry. DOING SOMETHING DIFFERENT is always so powerful. Sometimes just changing one thing can make you change your whole thought process and expectations of the day. My mom used to tell newly sober people to do one thing different every day. She would tell them that sleeping on a different pillow, brushing your teeth with your other hand - things as mundane as that - could switch you into a mode of major change. The older I get, the more brilliant I think my mom was. For lunch, I had half a sandwich and a can of beets. That doesn't sound like much but the bread was huge - that's why I only made a half. Now, I'm at rehearsal and will go to my friend's house for healthy dinner afterwards. I also found new tool on my iphone. It's called CARROT. It's a talking and hilariously shaming app that records your weight. When you input your height and weight, it develops a avatar for you. Here's mine. Standing and laying. Anyway, I'm kind of obsessed with logging in every day. 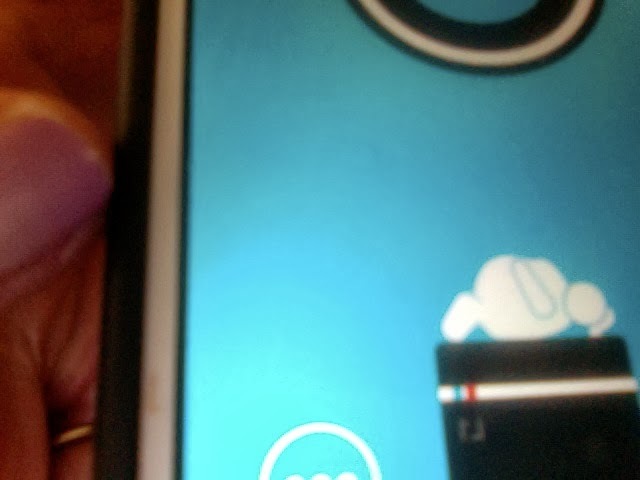 Today, my avatar was jumping up and down with happiness because I logged a one-pound loss. When you log a gain, it shames you. But, like I said, it's hilarious and not hurtful. And you know what's really weird? 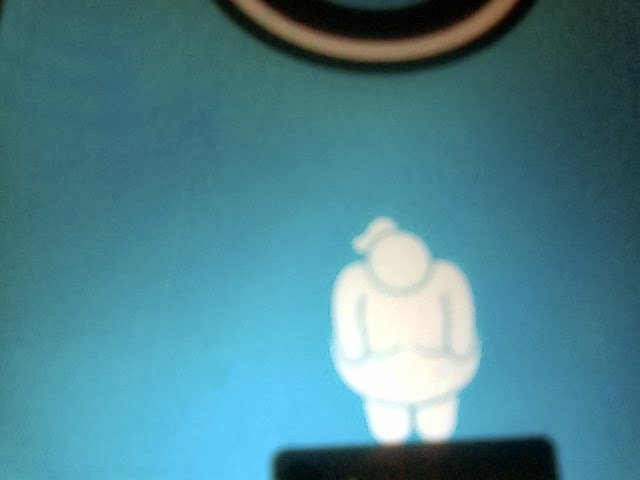 I think my avatar is kind of cute - even though she is fat. I need to transfer that opinion to the real me. I'm trying to turn the self-hate that I'm feeling into self-love. 1. Paying a really healthy cook to make me dinner three nights a week. Y'all may think this is silly, but listen..... I eat out nearly every night of the week. Really. It's my social life, it's what I like to do, I don't like to cook, blah, blah, blah. If I was rich, I really would hire my own chef - a la Oprah Winfrey. I don't have enough money to do that but I DO have enough money to eat what my friend feeds her family three nights a week. She cooks healthy stuff and serves NORMAL portions - not Jenny portions. I'll pay her to help her out with grocery shopping. 2. I'm joining the gym that B goes to. Will I go? Who knows. Will I go if I don't join? Obviously not. So, I improve my chances if I join. Right? I'm not going to pretend that I'm happy about this or that I'm ready and raring to get back on this path. I'm really feeling quite pissy at the moment and am feeling sorry for myself that I'm not one of those people who can eat and eat and not gain weight. Like my mother. What gives, MOM????? Why didn't I get that gene?? But, what I know is that no matter how much shame, no matter how much self hate, no matter how much embarrassment about having to "start over", I have to do it. One time it may take hold.